Everything now feels new, odd, and fragmentary. Constant negotiations of all aspects, totally revisioning how we live. Which is probably why my artistic practice over the past few months has been focused mainly on found objects newly sited. I love the notion of an organic, growing, collective writing—something fluctuating and developing as we go. As always, at the outset I reached out to a small team spread across three states for some help editing. Their targeted responses, vague apologies, and desires for ambiguity make everything clearer and more opaque all at once. BW:  I am on it > I have not slowed down for the past few days amidst my Dodge being fucked up. SE: Regardless of what is said, you will tinker with it until live time. If you’re being transparent about the nature of the shooting and treatment of the objects, maybe you should reveal how you shift meaning or emphasis in the writing process too. SS: Love it, Marc. The only place I stumble is with the phrase “shooting images on my phone.” Shooting has an expulsive sense to it. For me, that caries an unwanted tension when the photos and especially your descriptions which emphasize low-light intimacy and nesting. “Capturing images” or something similar might be more apropos. Perhaps getting rid of it altogether with something like this: using the camera on my phone, to record the quick sensations . . .
Hope this doesn’t derail you. Just wanting to keep it all close. My first sensation was finding a place to open it. My first attempt was not my own. Crouching on the floor of our closed garage under bare flood light, concealed behind black oil stains from our last car. A clearing marked with lines of etched rust on the raw night concrete. Metal shavings and dried seaweed from the lake. Some leaves, oak. No scent, my own inhalation. Many vessels: some empty, some full. Opening it quickly, turning it to face towards me, and capturing images of shadow volumes and new gestures caught in the tangled wire—their resonances leaving and shifting. Repeating this in the empty space alone now: opening, sensing, closing, transporting, departing. No ritual, no routine, but some newly improvised methods for divining the others communicating to us. Teacups, rosary beads, love notes—all of them accursed talismans (? ), briefly immobilized within us—traveling through muddy channels of memory in rhythmic ripples and thick layers, defining fields of their own gravity. An abandoned cardboard box lying on the side of the road, toppled over with one side cut apart, as though the previous owner had intentions of using the box as a temporary shelter or enclosure. Resembling a distended deer carcass, it causes night traffic to slow down abruptly, almost unconsciously. A dream caution. A cautionary dream. A secondhand wooden humidor lined in cherry and infused with the slowly evaporating yet lingering scent of the cigars it once previously held. 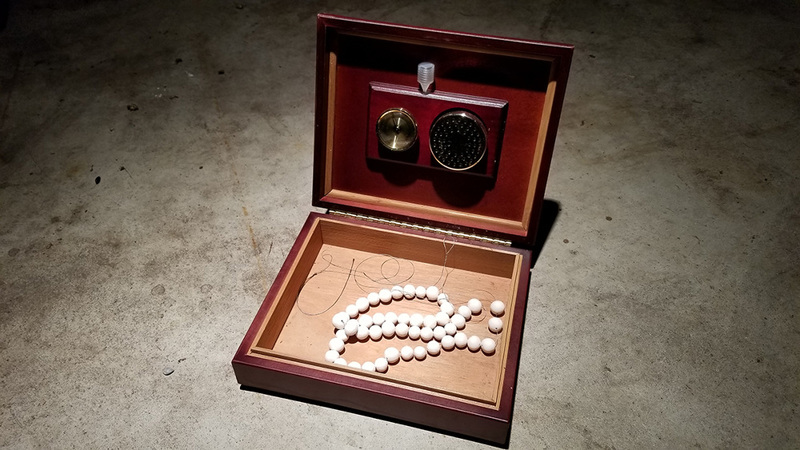 It now contains an unfinished set of bisque-fired rosary beads, strung onto a length of stainless steel thread, the beads slowly capturing the ethereal scent. The lacewood block, gifted by a woodworker upon his realization that the wood—procured to fabricate a new cabinet—caused him immediate, multiple, and intense allergic reactions including extreme skin and lung inflammation, resulting in all of his purchased exotic wood being wrapped and sealed inside heavy, black plastic with duct tape, and forgotten behind a saw on the floor of his shop. 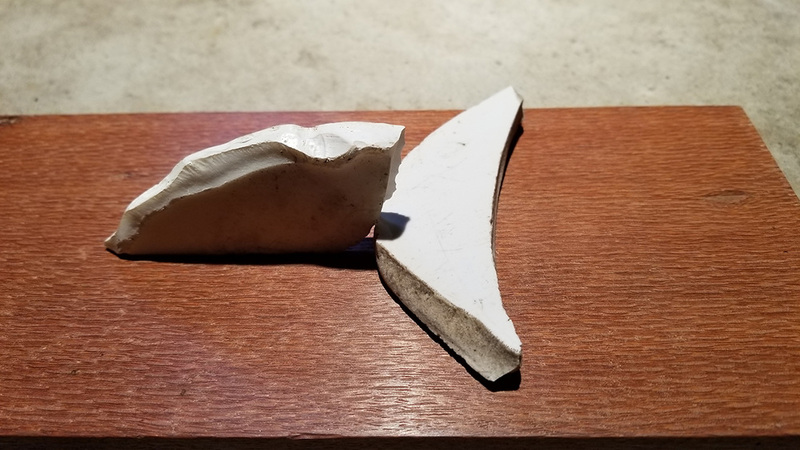 One small piece of this now holds two porcelain blades—one recovered from the parking lot of Meijer, the other from the parking lot outside of a warehouse; improvised weapons appearing both chipped and broken simultaneously. 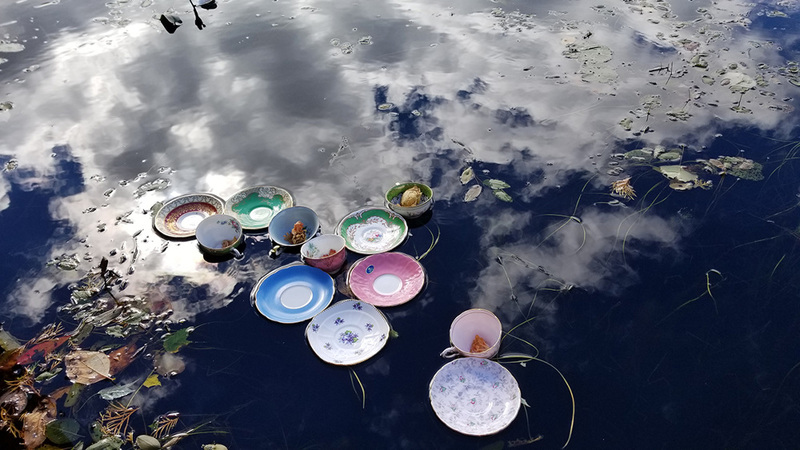 My grandmother’s collection of bone china teacup & saucer sets which, upon her death, were all quickly bequeathed to me and are now filled with dried roses and cactus flowers (culled from bouquets from two other, unrelated funerals) and then set adrift. A set of love letters encased in a glass mason jar with a fabric lid insert embroidered with a red letter K and tied with a red & white gingham ribbon. The most prominent letter (facing outwards) has a label written with red marker in large print which reads: KATH / I LOVE YOU!!! This object group was acquired sometime last year by a close friend at a yard sale in Moline, Illinois and sent here unread. 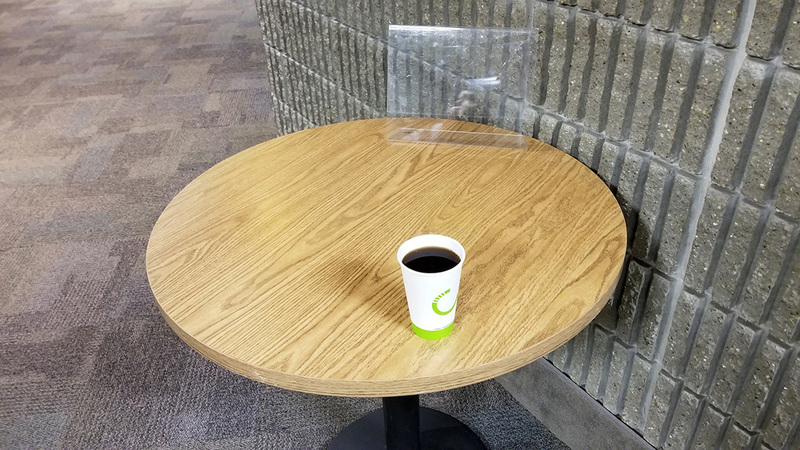 A cup of coffee, nearly full, left on a table across from the coffee machine that likely dispensed it. The cup, at first glance, appears to have never been drank from—the coffee becomes transcendent; a liquid portal, unused. 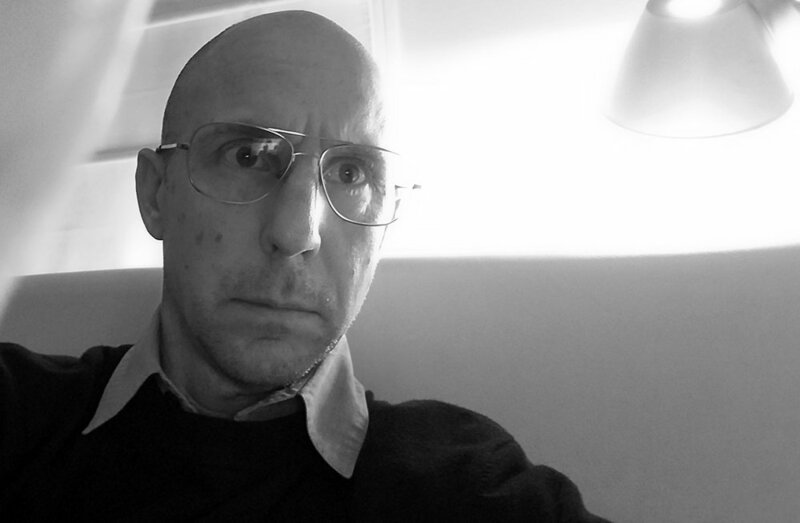 Although I maintained a zone of distance, my sense is that the contents of the vessel radiated slow heat, hovering just above room temperature, forever. 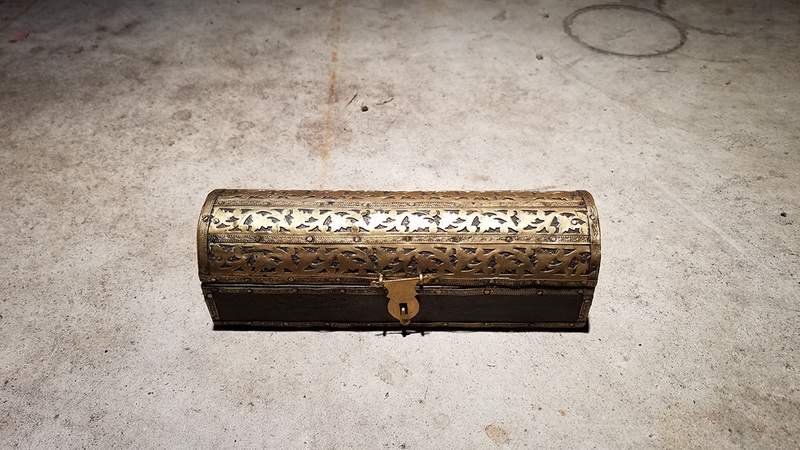 An embellished, ornate wooden box discovered in a closet after we had purchased our home, now containing a single blue sequin recovered from the Liberace Museum in Las Vegas, NV, after its untimely closure. A tanned deer hide, from a deer purportedly shot in 1986 or 1987 (although not July 1, 1987), processed in Ohio. A propane tank. A cardboard tag on the hide records a signature and the apparent charge for the service — 17.00 tax .94/ total 17.94 plus 2.00 for unidentified charges. A processing number 210-86 is present.